It’s tough to spot a stimulant-free fat burner that actually works. Caffeine and other stimulants work wonders to increase metabolism, and that benefit is simply difficult to source from another ingredient – which is why Evogen Carnigen piqued our interest. 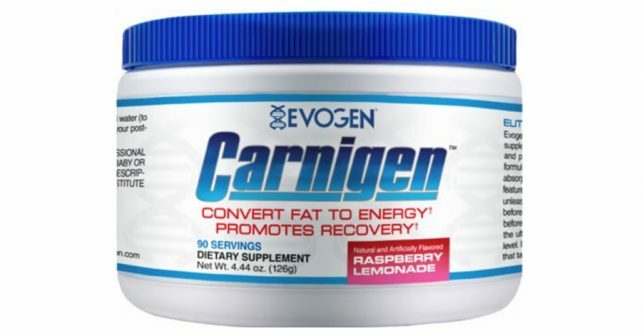 Evogen Carnigen is a stimulant-free fat burner created by Evogen Nutrition. You might have heard of Evogen Nutrition because of their other products Lipocide and GlycoJect. Evogen Carnigen is just one of the hard-hitting supplements that Evogen Nutrition markets to help individuals burn fat more effectively. In essence, Evogen Carnigen is just a blend of Carnitine. It features four kinds of carnitine to help you burn fat. According to their product website, each for of carnitine selected for Evogen Carnigen was evaluated based on effectiveness and potency. It’s no secret that there are many carnitine-based products that are simply duds, and Evogen Nutrition wants Carnigen to be the brand you think of when you’re shopping for carnitine supplements. L-Carnitine is one of the most widely-used fat burners in the market today. You see it mixed with slimming beverages and other supplements. The most important role that L-carnitine plays in the body is the metabolism of fat, particularly long-chain fatty acids into the mitochondria of cells, where it can be oxidized and used as fuel to generate ATP, which powers your muscles. Evogen Carnigen is particularly used by individuals who prefer a stimulant-free formula for fat burning. Alternatively, Evogen Carnigen can be used to stack with other stimulant-based fat burners to maximize the amount of fat burned by the body during exercise. The added energy that is produced by the metabolism of fat can help fuel longer, more intense workouts. L-Carnitine L-Tartarate – a highly bioavailable form of carnitine known for providing cellular energy and recovery from exercise. Acetyl L-carnitine – a form of nootropic that supports brain energy levels to enhance concentration. L-carnitine orodate – a stable ionic compound of carnitine that has been shown to benefit blood sugar levels. Low blood sugar equates to a higher fat metabolism. L-Carnitine L-fumarate – a stable form of L-carnitine that speeds up the transport of fatty acid to be used for energy production. While Evogen Carnigen is an effective blend of Carnitine, carnitine alone could not help most users burn fat fast enough. In a nutshell, carnitine helps you utilize fat, but unless there is an outlet for the energy other than metabolism, it wouldn’t be as effective as the best fat burning supplements. As a stimulant-free fat burner, it gives the manufacturer plenty of room to add all the bells and whistles that many stim-based fat burners miss. It would have helped if there was some form of appetite suppression benefit, and the product could have been a hit. However, they saved that for another formula, Lipocide. After all, it’s all about the profit. If you’re looking to lose fat fast without stimulants, then you’re best off with Garcinia X with Garcinia Cambogia. Garcinia X’s fat burners plus appetite suppressant benefits is simply the best in the business. Check it out.